We will discuss about the interdependence of plants and animals. We are aware of the fact that human-beings depend upon plants and animals for food and other requisites of life. Do plants and animals also depend upon each other? Plants and animals also depend on each other. They do so in many ways. 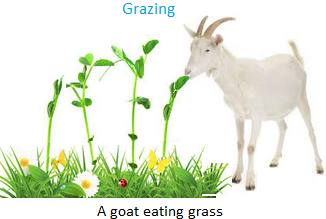 (i) Some animals eat grass and green leaves of plants. They are called herbivorous. Many animals also eat grains and other products of plants. Dung of animals, droppings of birds etc. are used to make manure. This manure helps to increase fertility of the soil and fertile soil helps the plant to grow better. Thus, plants and animals help each other. (ii) Flesh eating animals eat flesh of other animals, some of which depend on plants for food. Growth of the plants depends upon the manure coming from the animals droppings. So animals depend upon plants and plants depend upon animals. (iii) Human beings depend on both plants and animals for food. Human beings breathe in air containing oxygen. This oxygen is needful for our life. We breathe out carbon dioxide which mixes in the atmospheric air. Thus we take in oxygen from the air and give out carbon dioxide to it. Like human beings all the animals (living things) adopt this process of taking in oxygen and giving out carbon dioxide. So, green plants take carbon dioxide from the air. This carbon dioxide is used in preparing food for the plants by the process of photosynthesis. During the process of photosynthesis oxygen is given out to the air. Thus green plants take in carbon dioxide from the air and give out oxygen to it. 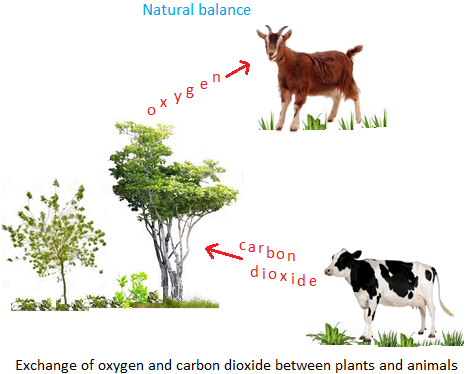 The oxygen thus released in air by the plants is taken in by animals who in return give out carbon dioxide to the air to be taken by the plants. Thus a natural balance of oxygen and carbon dioxide in the atmosphere is maintained by plants and animals.